Administration Managers are responsible for the smooth running of the business, it is the duty of the administration manager to supervise the staff, plan communicative system, support the directors, and implement measures. They need to take charge of the day to day organizational operations apart from supporting the staff. 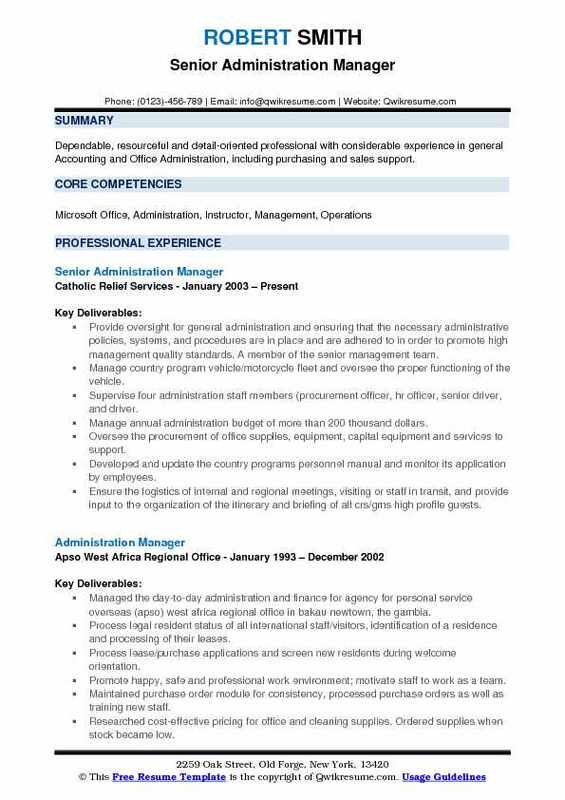 Administration Manager Resume Sample projects various other responsibilities such as overseeing the financial plans, managing and supervising the office and its team, and performing certain human resources duties. Those seeking to make a career as an Administration Manager should outline certain skill sets such as Critical thinking, attention to detail, project management skill, ability to motivate staff and coaching. 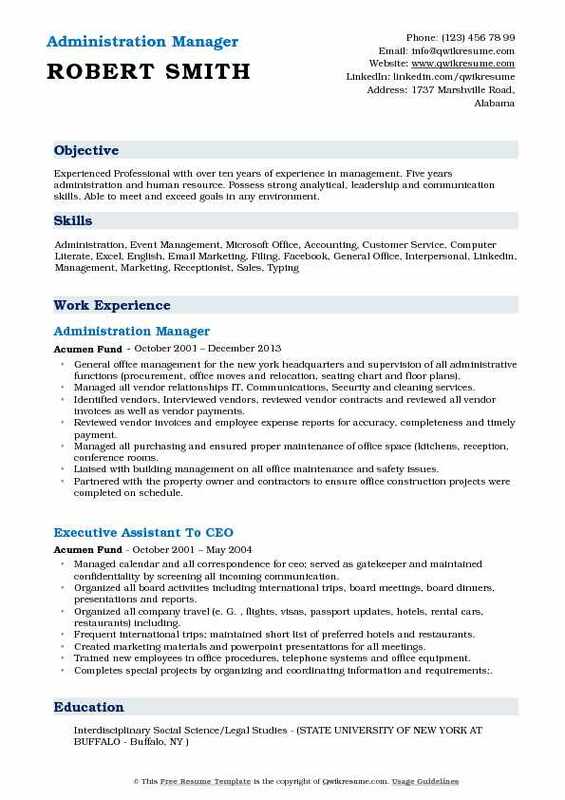 The best Administration Manager resume includes A Degree in Business Administration or its related field for seeking this job post. 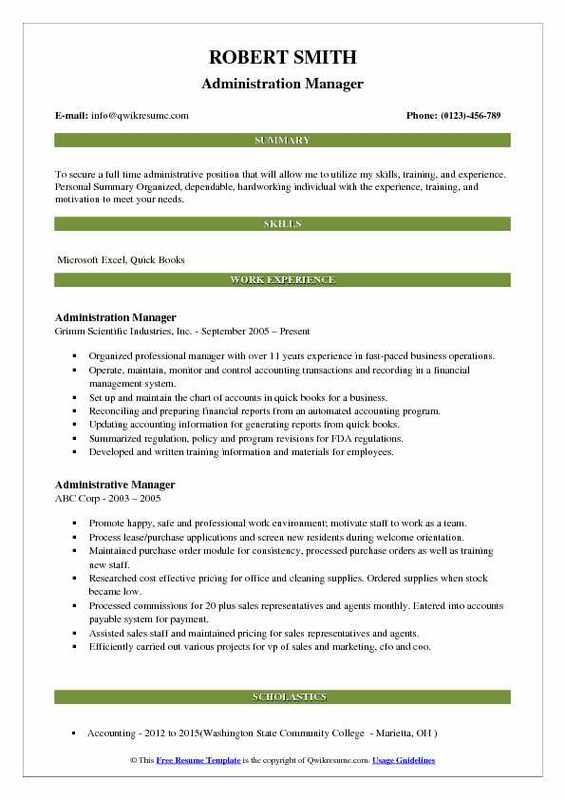 Summary : Seeking an Administration Manager position where my skills, especially in the areas of non-profit administration, finance, and human resources, can be utilized to achieve company goals and objectives. Provided administrative and clerical support to 3k+ personnel to include preparing correspondence, presentations, filing, record, and timekeeping. Implemented administrative correspondence tracking system that helped in providing improved customer service. Maintained daily schedules for 12 supervisors to include making travel arrangements; and coordinating meetings and conferences. Cross-trained all personnel in the department to enable the timely completion of 150 awards, 50 evaluations, and 300+. Processed over 150 fitness and evaluation reports, 150 command instructions, 100 temporary duty orders, and 13. Coached, trained and supervised staff in organizational policies and procedures to effectively increase effectiveness. Organized activities and maintained disciplines to consistently implement best practices. Summary : Dependable, resourceful and detail-oriented professional with considerable experience in general Accounting and Office Administration, including purchasing and sales support. Provide oversight for general administration and ensuring that the necessary administrative policies, systems, and procedures are in place and are adhered to in order to promote high management quality standards. A member of the senior management team. Manage country program vehicle/motorcycle fleet and oversee the proper functioning of the vehicle. Supervise four administration staff members (procurement officer, hr officer, senior driver, and driver. Manage annual administration budget of more than 200 thousand dollars. Oversee the procurement of office supplies, equipment, capital equipment and services to support. Developed and update the country programs personnel manual and monitor its application by employees. Ensure the logistics of internal and regional meetings, visiting or staff in transit, and provide input to the organization of the itinerary and briefing of all crs/gms high profile guests. Develop and implement an information management system to ensure efficient allocation, management, and control of resources, and adhere to donor-source accounting principles for all departments. Summary : To secure a full time administrative position that will allow me to utilize my skills, training, and experience. 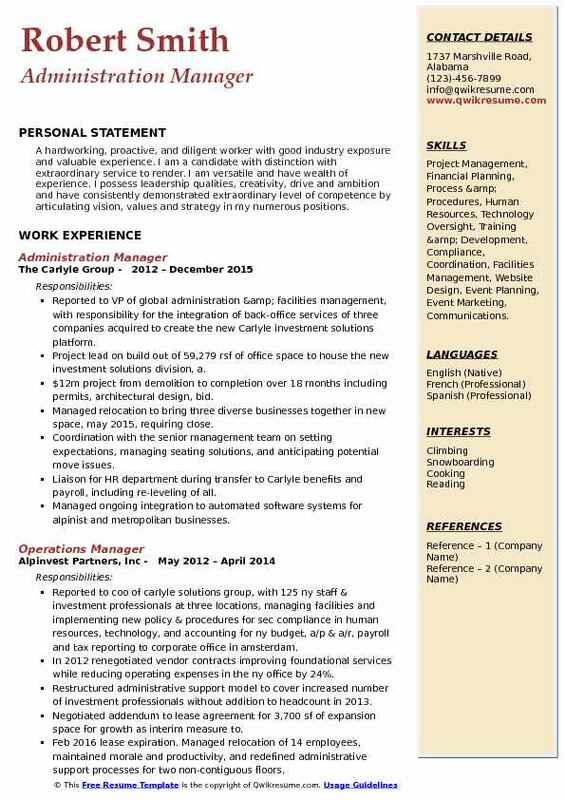 Personal Summary Organized, dependable, hardworking individual with the experience, training, and motivation to meet your needs. 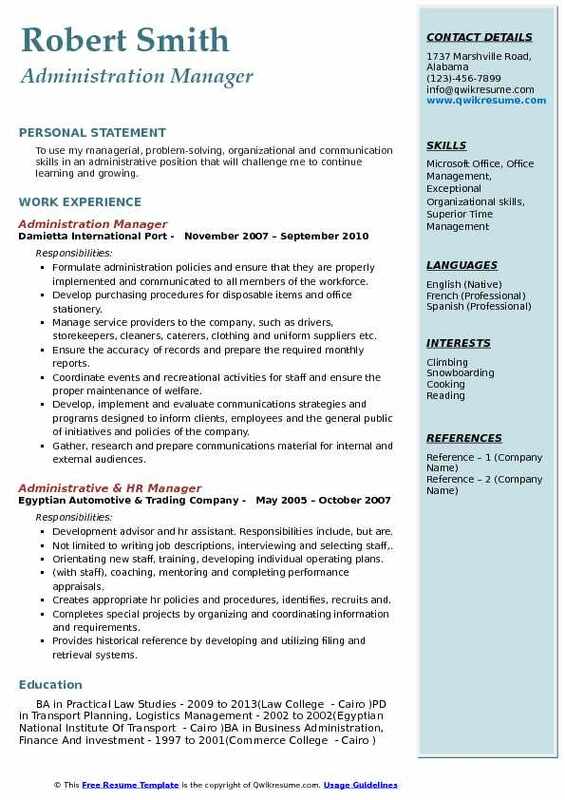 Organized professional manager with over 11 years experience in fast-paced business operations. Operate, maintain, monitor and control accounting transactions and recording in a financial management system. Set up and maintain the chart of accounts in quick books for a business. Reconciling and preparing financial reports from an automated accounting program. Updating accounting information for generating reports from quick books. Summarized regulation, policy and program revisions for FDA regulations. Developed and written training information and materials for employees. Utilize standard software programs Microsoft word, excel and quick books. Operated, maintain and monitored accounting transactions in an excel spreadsheet. Examined documents for accuracy and completeness according to standard operating procedures according to the federal drug administration. Operated, maintained and monitored material requirement plans to ensure all materials are available in time for the manufacturing process. Operated, maintained and tracked year-end inventory and loss prevention for profit and loss results. 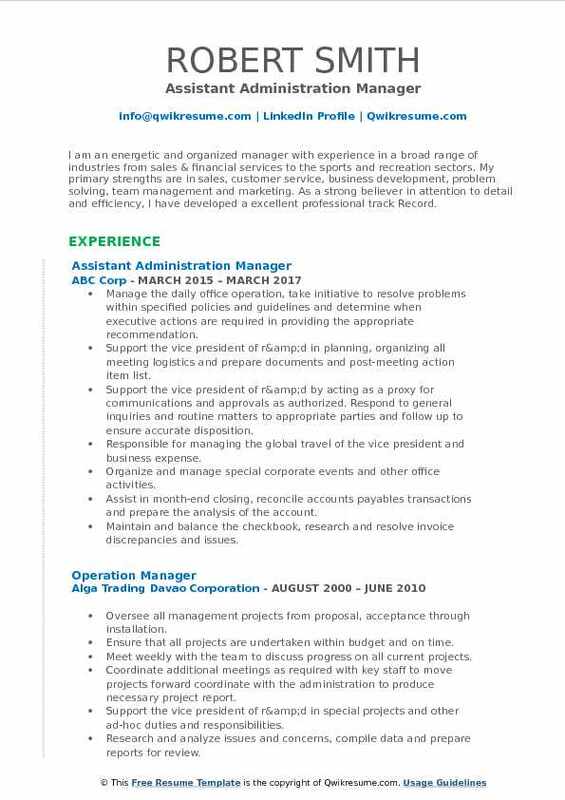 Summary : I am an energetic and organized manager with experience in a broad range of industries from sales & financial services to the sports and recreation sectors. My primary strengths are in sales, customer service, business development, problem solving, team management and marketing. As a strong believer in attention to detail and efficiency, I have developed a excellent professional track Record. Manage the daily office operation, take initiative to resolve problems within specified policies and guidelines and determine when executive actions are required in providing the appropriate recommendation. Support the vice president of r&d in planning, organizing all meeting logistics and prepare documents and post-meeting action item list. Support the vice president of r&d by acting as a proxy for communications and approvals as authorized. Respond to general inquiries and routine matters to appropriate parties and follow up to ensure accurate disposition. Responsible for managing the global travel of the vice president and business expense. Organize and manage special corporate events and other office activities. Assist in month-end closing, reconcile accounts payables transactions and prepare the analysis of the account. Maintain and balance the checkbook, research and resolve invoice discrepancies and issues. Process 300 invoice per month; create, maintains vendor files and sort, code and match invoices. Review and verify invoices and check requests for vendors and employees business expense. Support internal and external audit activities to ensure auditors are provided with necessary information to complete timely audits. Review and prepare the information and documents for the monthly budget report. Summary : To use my managerial, problem-solving, organizational and communication skills in an administrative position that will challenge me to continue learning and growing. Formulate administration policies and ensure that they are properly implemented and communicated to all members of the workforce. Develop purchasing procedures for disposable items and office stationery. Manage service providers to the company, such as drivers, storekeepers, cleaners, caterers, clothing and uniform suppliers etc. Ensure the accuracy of records and prepare the required monthly reports. Coordinate events and recreational activities for staff and ensure the proper maintenance of welfare. Develop, implement and evaluate communications strategies and programs designed to inform clients, employees and the general public of initiatives and policies of the company. Conduct public opinion and attitude surveys to identify the interests and concerns of key groups served by the company. Develop and organize workshops, meetings, ceremonies and other events for publicity and information purposes. Ensure that dipco health, safety, security & environment policy and procedures are observed as well as all relevant safety legislation and the provisions of the relevant government of Egypt health and safety & environmental acts. Summary : Experienced Professional with over ten years of experience in management. Five years administration and human resource. Possess strong analytical, leadership and communication skills. Able to meet and exceed goals in any environment. General office management for the new york headquarters and supervision of all administrative functions (procurement, office moves and relocation, seating chart and floor plans). Managed all vendor relationships: IT, Communications, Security and cleaning services. Identified vendors, Interviewed vendors, reviewed vendor contracts and reviewed all vendor invoices as well as vendor payments. Reviewed vendor invoices and employee expense reports for accuracy, completeness and timely payment. Managed all purchasing and ensured proper maintenance of office space (kitchens, reception, conference rooms. Liaised with building management on all office maintenance and safety issues. Partnered with the property owner and contractors to ensure office construction projects were completed on schedule. Partnered with human resources with onboarding and offboarding of employees (performance management). Created and maintained corporate disaster recovery/business continuity plan for new york office, and executed. Organized all corporate events (annual global staff retreats, holiday parties, team outings, bring your child to work). Set up new hires and visiting employees with workspace - set up desks, phones and issue security id badges. Summary : To share my abilities and to grow my personal capabilities as I render my services with integrity to the company that welcomes me to join their workforce. Manage helpdesk tier 2 and tier 3 escalation phone calls and maintained a 95% internal survey approval rating. Oversee night watch operations for all batch processing operations to ensure alerts are responded to in a timely manner. Manage multiple resource assignments across business departments, which enables the department to have fewer FTE headcounts while maintaining project assignments. Implemented full automation processes saving the need for manual processes and extra headcounts. Implemented auto importing of document images for retention, which has saved 2 hours of work each day. Implemented a disaster recovery plan, which enables the credit union to fail over to any of the other two servers in 9 minutes; this process has saved 51 minutes of downtime in emergency situations. Implemented the credit unions first application patch management process with a dr plan; this has eliminated more than 2 hours of downtime per security patch process. Created and oversaw training materials and documentation for the operations team; this enabled us to quickly resolve outages in a timely manner. Maintain vendor relationships and stay current on product offerings that could support the needs of the company and departmental teams. Facilitate core banking projects and effectively engage cross-functioning teams to ensure projects are completed in a timely manner. Implemented team and individual development plan to foster employee growth and promote from within. Worked closely with accounting to implement an accounts payable invoice workflow with imaging, which streamlined a paperless approval process for all credit union management. 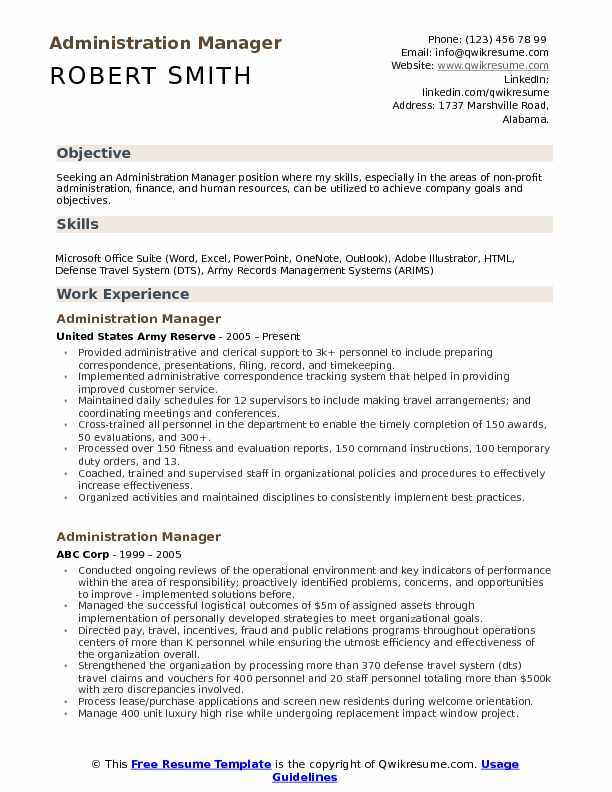 Summary : Experienced professional with a verifiable record of accomplishment in administration and sales Master in organizational solutions and process improvements that increase efficiency and decrease the bottom line Possess advanced computer skills in Microsoft Office software. Responsible for managing all office administrative activities coordinating the day-to-day requirements to keep a busy facility operating smoothly. Work as travel coordinator for brokers; made reservations and process monthly expense reports in concur travel system. Money handling, excel, word, e-mail, 10-key entry, calendaring, and use of all office machinery. Responsible for planning, managing, and directing budgets for equipment, contracts, and supplies. Manage the office group calendar; setup and manage office meetings, visitors and conference room reservations. Answered multi-line telephone and direct calls to the appropriate department/division. Process maintenance request with the building using work speed; ensure environmental, health, and security standards are maintained as per government rule and regulations. Manage building and tenant access for both Willis RE and Willis tower Watson; follow-up and track guests for both positive and negative feedback. Supervise maintenance and repair work of mechanical, electrical and electronic equipment and machinery. HR liaison; onboarding of new employees/out processing existing employees; track and manage vacation/sick days. 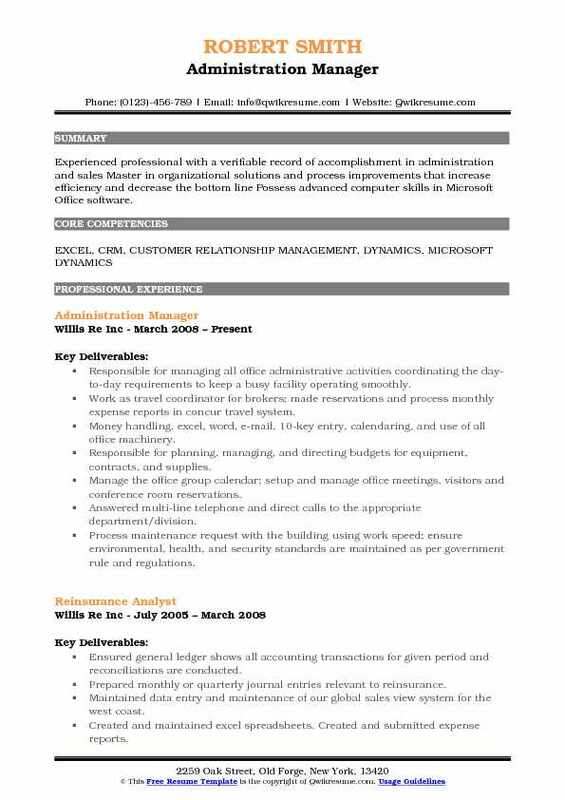 Microsoft dynamics customer resource management coordinator; manage office pipeline updates; enter existing clients and new opportunities; respond to questions and resolve CRM issues. Set up and maintenance of the e-files and auditing files; backup broker teams with wem checklists and webs data entries. Objective : A hardworking, proactive, and diligent worker with good industry exposure and valuable experience. I am a candidate with distinction with extraordinary service to render. I am versatile and have wealth of experience. I possess leadership qualities, creativity, drive and ambition and have consistently demonstrated extraordinary level of competence by articulating vision, values and strategy in my numerous positions. Skills : Project Management, Financial Planning, Process & Procedures, Human Resources, Technology Oversight, Training & Development, Compliance, Coordination, Facilities Management, Website Design, Event Planning, Event Marketing, Communications. Reported to VP of global administration & facilities management, with responsibility for the integration of back-office services of three companies acquired to create the new Carlyle investment solutions platform. Project lead on build out of 59,279 rsf of office space to house the new investment solutions division, a. $12m project from demolition to completion over 18 months including permits, architectural design, bid. Managed relocation to bring three diverse businesses together in new space, may 2015, requiring close. Coordination with the senior management team on setting expectations, managing seating solutions, and anticipating potential move issues. 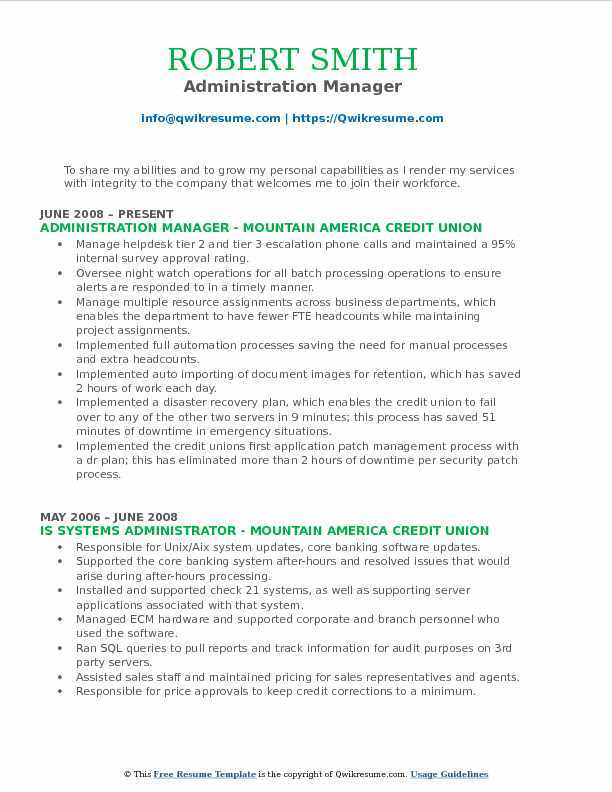 Liaison for HR department during transfer to Carlyle benefits and payroll, including re-leveling of all. Managed ongoing integration to automated software systems for alpinist and metropolitan businesses. Coordinated vendor integration for three businesses in global offices (Amsterdam, Hong Kong, Toronto, San Francisco, and Indiana), as a member of the Carlyle global purchasing forum. Structured operational processes and procedures for new office space, including mail distribution, Production center, inventory & procurement, vendor relationships, maintenance contracts, and conference. Summary : 29 years in the finance and accounting field. Experience in the manufacturing and technology business with excellent communication skills and the ability to work with a team to ensure goals are met or exceeded. Manage the entire sales cycle from signature to delivery and acceptance. 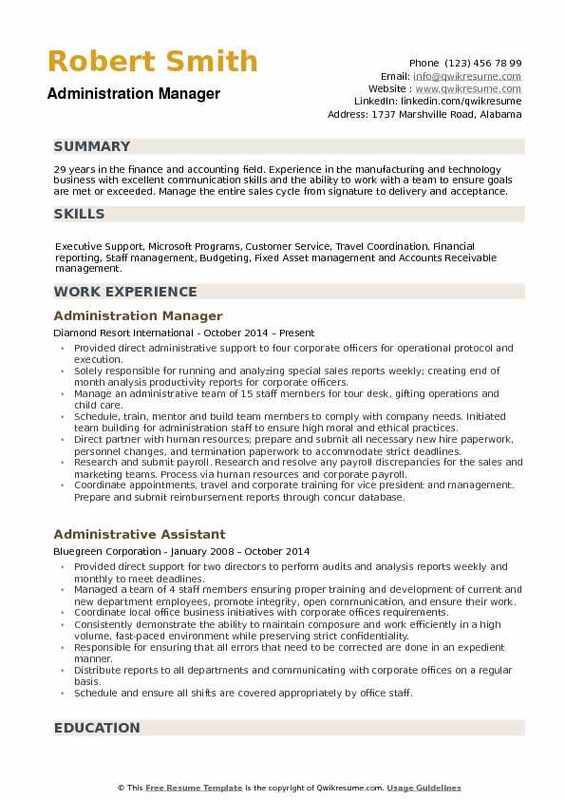 Skills : Executive Support, Microsoft Programs, Customer Service, Travel Coordination, Financial reporting, Staff management, Budgeting, Fixed Asset management and Accounts Receivable management. Provided direct administrative support to four corporate officers for operational protocol and execution. Solely responsible for running and analyzing special sales reports weekly; creating end of month analysis productivity reports for corporate officers. Manage an administrative team of 15 staff members for tour desk, gifting operations and child care. Schedule, train, mentor and build team members to comply with company needs. Initiated team building for administration staff to ensure high moral and ethical practices. Direct partner with human resources; prepare and submit all necessary new hire paperwork, personnel changes, and termination paperwork to accommodate strict deadlines. Research and submit payroll. Research and resolve any payroll discrepancies for the sales and marketing teams. Process via human resources and corporate payroll. Coordinate appointments, travel and corporate training for vice president and management. Prepare and submit reimbursement reports through concur database. Head major projects from start to finish regarding installation and/or renovation of sites; ensure completion and quality of each project. Facilitate the new hire process for the sales department to include, weekly tracking and reporting deadlines, new hire approval requests, setting appointments and requesting hiring approval from corporate offices. Work closely with resort operations to ensure that all billing is processed through the right departments. Create and distribute departmental memos, letters. Book and coordinate all aspects of special events.